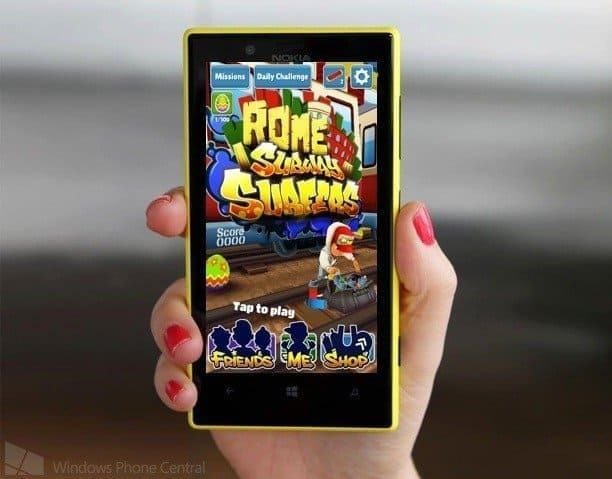 We have got some great new for those who play a lot of high quality games on their smartphones and this is for Windows Phone users, Subway Surfers now support 512 MB RAM devices. And this comes wit the Paris update of the game where you will need less hardware requirement and also be able to play this game on your phone which has RAM lower than 1GB, last month, it was confiremed that some updates including Facebook, Skype and Subway Surfers are on the way to Windows Phone 8.1 devices and here it is. In the last update, Tokyo was included as a part of the world tour and now they are in Paris with new colorful outfits for Coco (who is returning to the game) and Prince K, also some new powerup awards and a sci-fi Teleporter board. Currently, this one is the only game to cope up with regular updating on Android and iOS, and now in all Windows Phone the game can be played well. And they have added a lot of cities in their every update as the base theme, like NYC, Miami, Seoul, Tokyo and now Paris, right with Android and the iOS. The game is highly appreciated by all kinds of users, and whatever may be its type, it is now probably the most updated game on every single platform, including Windows. And the thing I liked very much was “I Got the Power” awards which you get by picking up powerups whenever possible. Get it from the respective App Stores. Enjoy.